Why Buy Your Portable A-Frame Cabin from Yoder’s Dutch Barns? Portable A-frame cabins are among the most versatile buildings we offer at Yoder’s Dutch Barns. Hunting cabins—If you’re a hunting enthusiast, there’s nothing better than having a cabin outfitted for your needs right in the middle of the wilderness. These cabins are small enough to fit in tight areas among the trees, but large enough to accommodate everything you’ll need for an early morning hunt or a prolonged stay in the woods. Guest cabins—Need extra room to accommodate your guests? Our portable A-frame cabins are the ideal solution. With sizes ranging all the way up to 14’x40’, you’ll have no problem creating a comfortable and spacious living area for your friends and relatives. 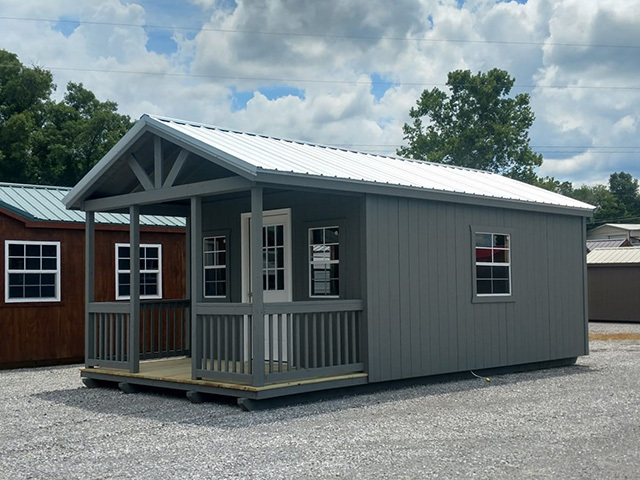 And because they’re portable, you can easily place your guest cabin in a convenient area on your property. Relaxation cabins—Sometimes you just want a chance to get away from it all. With your own portable A-frame cabin, you won’t have to worry about booking a hotel or privately-owned cabin on someone else’s land. Instead, you can enjoy nature and the solitude of cabin life on your own property. Our portable A-frame cabins aren’t just useful and versatile—they’re also well-built with plenty of high-quality features. Covered porch—You and your guests won’t be confined to the inside of the cabin, even during inclement weather. Sit under the covered porch and enjoy a book, a cup of coffee, or just taking in the sights and sounds. Range of sizes—Not everyone needs a large cabin, nor do they have the space for one. We offer cabins ranging in size from 8’x12’ all the way up to 14’x40’. Get the exact size and layout you want for your property and your needs. Materials that are built to last—Our cabins come with a 12-month warranty and they’re built to last. Choose between 25-year shingles or 40-year metal roofs and enjoy the perks of materials like LP prostruct flooring, T1-11 siding, and D-grade/pressure-treated trim work. Ready to get your own portable A-frame cabin? Give us a call at (615) 789-1030, complete an online order form, or visit our showroom and manufacturing facility in Cumberland Furnace, Tennessee, today.